Is It Ok To Be Black In Orlando? We have a teachable moment here folks. Let’s hope everyone is ready to learn. Not long ago, I posted an article about White Political Consultants not being able to get out the Black vote. Read said article here. No better display of a PR nightmare is there than the recent “It’s ok to be Black” campaign launched on behalf of Paul Paulson in the mayoral race involving Paulson, Buddy Dyer, and Linda-Marie Grund. 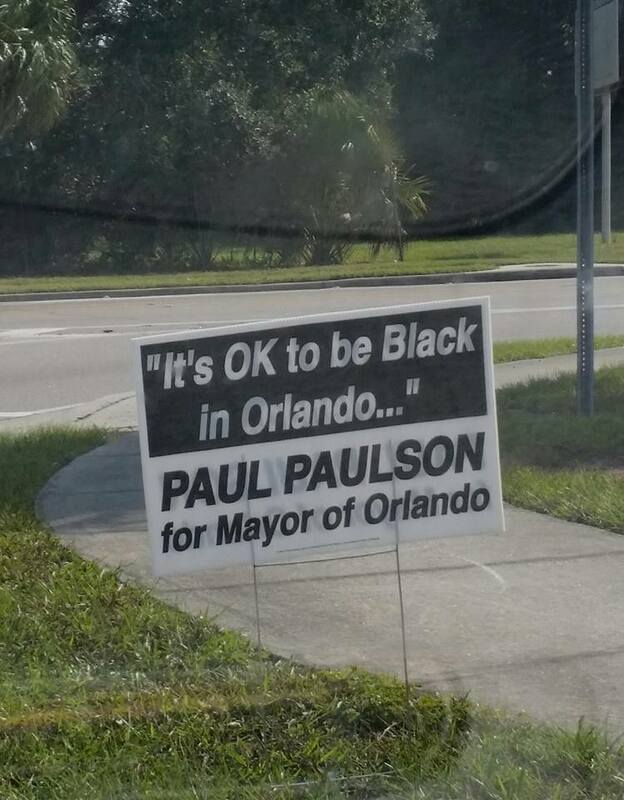 Some in the Black Community are in a tizzy over signs displayed saying that it is “ok to be Black in Orlando”. They feel like Paulson is giving them permission to be black, and how dare he do so. It goes to show that the need to hire competent minority Political Consultants to reach our community is there. But does it change the fact that Buddy Dyer has not addressed the needs of the community? Has it changed the state of affairs that the Orlando Black Community finds itself in? no it does not. We cannot get so caught up in pettiness, that we lose sight of the big picture, which is that Buddy Dyer has not done a damn thing for the African American Community in Orlando. First and foremost the excessive police brutality cases involving the Orlando Police Department should make you cringe. That is enough to throw him out right there. The Noel Carter case makes my heart ache, and should make yours ache as well. That is worth far more than a yard sign. Get your priorities straight people. The trial of the officer who battered Refes Holloway started today. You do remember him, don’t you? If you don’t, let me refresh your memory. Terre Johnson, the homeless veteran, remember him? The list goes on, people. Moving right along, let’s discuss Buddy Dyer’s attempt to steal Faith Deliverance Temple Church by eminent domain. Thankfully the Church won, but the fact that he tried to take this from Parramore should tell you what he thinks of Black people and Black property. The closing of Parramore Avenue without a transportation or traffic impact study so he could build a soccer stadium on top of Parramore should also tell you what he thinks of Black people and Black property, and yet you are screaming about a yard sign? Harriet Tubman had it right. She would have freed more slaves, had they known they were slaves. Your health should be important to you. Your community is contaminated, but does Buddy Dyer care? No he does not. He is using the demographics of Parramore to get EPA grants, but he is not using the money to help you with health issues, he is using the money to clean up the land for the proposed soccer stadium. He gives less than a damn whether you live or die. So while the yard signs that were placed were indeed ridiculous, you MIGHT want to ask yourselves, under Buddy Dyer, is it ok to be Black in Orlando??? Mind Control is the destruction of the soul as the great Bob Marley stated. I just read the re-election of Buddy Dyer swept the election. I guess the voters made the decision the longest serving mayor in Orlando’s history.